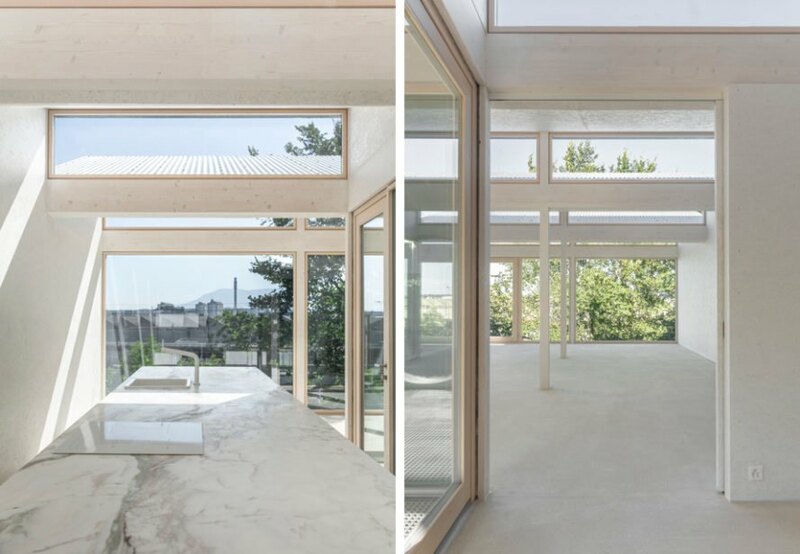 In the centrally located town of Lancy in Geneva, Switzerland, a compact and experimental timber home bucks the local archetype for concrete-based housing in favor of a more eco-friendly alternative. 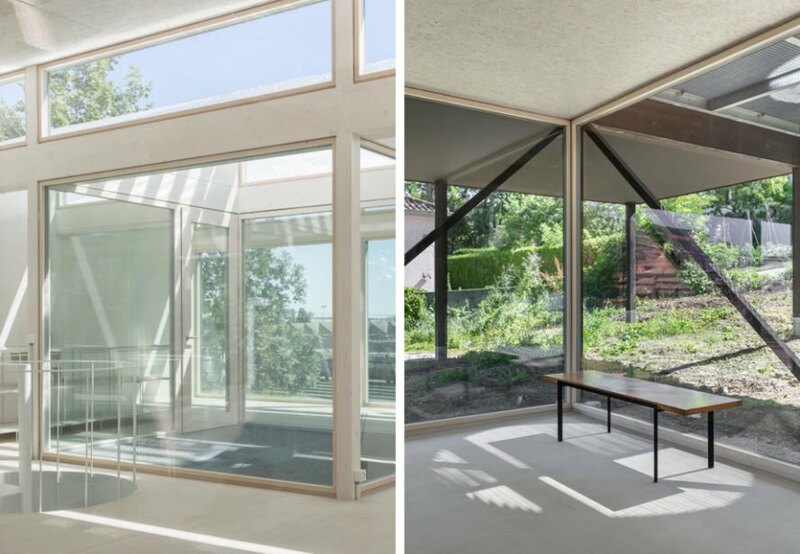 Swiss architect Leopold Banchini collaborated with engineer Marc Walgenwitz to design the light-filled abode — dubbed the Casa CCFF — using a prefabrication system that minimizes construction costs as well as waste. The small urban home was built for energy efficiency and assembled in just a few days by local carpenters. 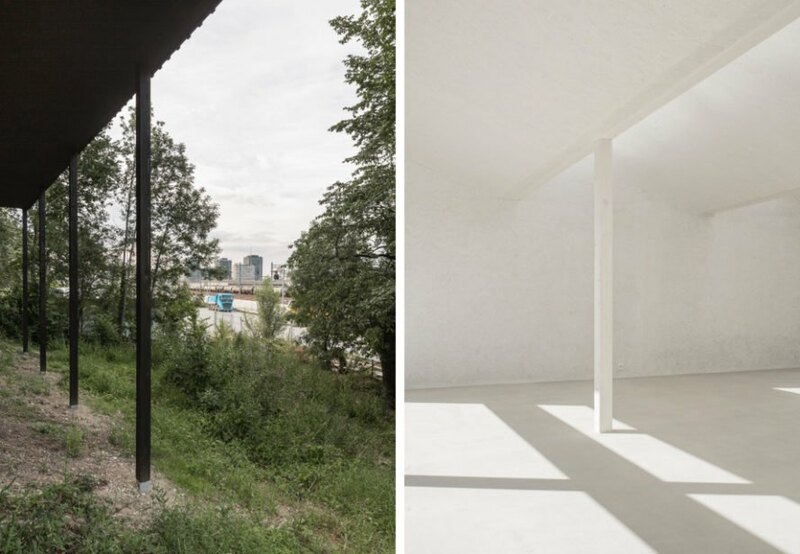 Built overlooking Geneva’s industrial train station, Casa CCFF references its surrounding industrial environment with a sawtooth shed roof that floods the interior with natural light. Connections to nature, however, dominate the majority of the design, which boasts two interior gardens on the upper level and carefully framed views of the landscape for indoor-outdoor living. The primary living spaces are located on the open-plan upper floor while the ground level features a much smaller built footprint and is mainly used as a covered outdoor space for living and parking. The prefabricated home can be understood as a series of square modules laid out in a square four-by-four module plan. 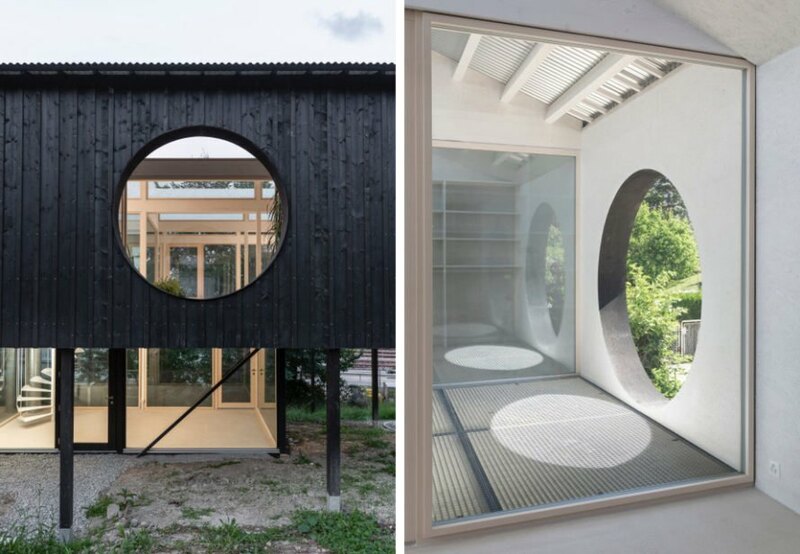 The compact ground floor, for instance, is made up of three modules: a single outdoor living space and a double-width interior space that connects to the upper floor via a spiral staircase. Upstairs, an open-plan layout with a kitchen, living room and dining area takes up roughly three-quarters of the area while the remaining space is dedicated to the two interior gardens, bedroom and bathroom. 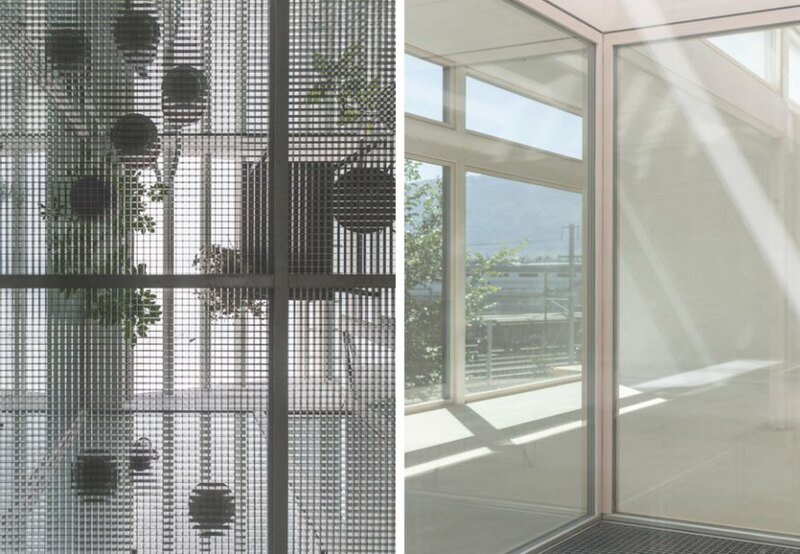 Casa CCFF is a domestic factory floating above an untouched garden. The house is built almost entirely in wood, pushing the structural capacities of this natural and sustainable material to its limits. The use of wood for the home also helps reduce the use of concrete to a bare minimum. By incorporating high insulation values and maximizing solar gain, a small heat pump allows the modern home to avoid the use of fossil fuels. This experimental home in Switzerland is designed by Leopold Banchini. The home uses prefab construction and timber materials to minimize waste. The house overlooks a train station. The building is meant to be a more sustainable home compared to concrete-based housing. Glass walls throughout the house bring in plenty of natural light. The building embraces an industrial design. The home avoids using fossil fuels for energy.